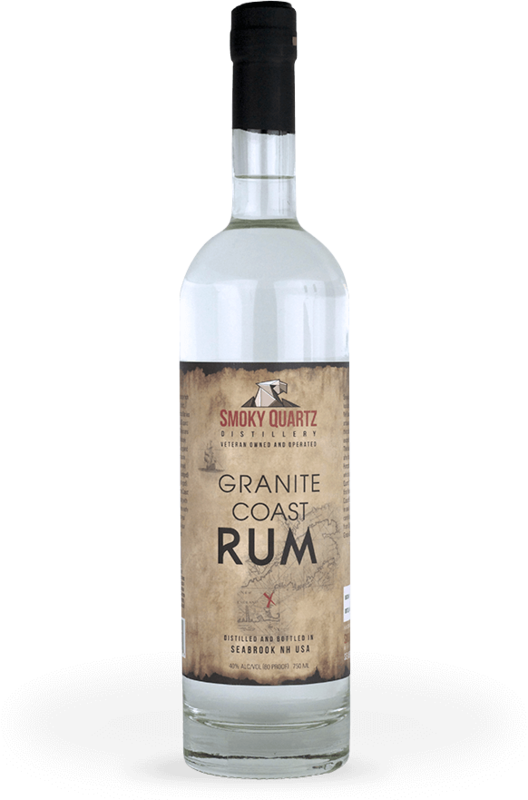 Granite Coast Rum is made with 100% American Molasses and fermented at a high temperature with a champagne yeast. It is distilled only once in our 8 plate still and only the ‘heart’ of the rum is used. We allow the rum to rest for over 2 weeks to ‘breathe’ and develop its full taste. The final cut to 80 proof is done using pure New Hampshire Monadnock spring water. No charcoal filtering is done–it’s not needed! Place a sugar cube or equivalent into a coffee cup, mug, or glass of your choice. Fill 2/3 full with boiling water. Garnish with a slice of lemon, dust with nutmeg, and serve. In the Glass: Crystal clear with an almost imperceptible gold. Swirling the spirit leaves a delicate ‘sheet’ of spirit in the glass that quickly descends down the glass wall. Smell: A light caramel with a slight fruitiness. Drinking/Pairing Suggestions: This rum is well bodied enough to be a sipping rum, it can be served neat,chilled as a ‘martini’ with a twist of citrus (lemon, lime, etc). Excellent as a Mojito and/or a Caipirinha. Pair it with a tropical dish (I recommend coconut crusted shrimp) to remind you of summertime and warmer climates.